After heading up the Sawtooth National Forest Avalanche Center for nearly a decade, Janet Kellam will be stepping down after this year's avalanche forecasting season. Kellam said she will be "stepping back to take some time for other things" after becoming a well-known authority on avalanches and backcountry conditions throughout the Wood River Valley. "It's a good time for me to step away from the avalanche center," Kellam said in an interview. "There are great people working there and the community is really supporting it." Kellam, 53, has been the director of the center since 2001, but has been involved in avalanche work since 1981, becoming the first woman in Idaho history to earn a lead backcountry ski guide license. Kellam began working as lead forecaster for the center in 1996 before taking over as director, a newly created position at the time. She will continue working at her avalanche duties through April and stay on part-time throughout the summer to take care of administrative responsibilities before fully retiring from her post at the end of the summer. A replacement for Kellam will not be announced until right before the start of the 2010-11 avalanche season. Though the position will be advertised nationally, two prime candidates are likely Kellam's co-workers and current forecasters Chris Lundy and Blase Reardon. This trio of avalanche forecasters combines extensive field observations with detailed weather forecasting to come up with the daily avalanche advisories that local skiers, snowboarders and snowmobilers rely on as they head into the snowbound hills. Though their primary focus is the mountains immediately surrounding the Wood River Valley, the crew also keeps an eye on the avalanche risks in the northern Sawtooth Mountains near Stanley, the western Smoky Mountains and Fairfield-area Soldier Mountains. "The center is in a great place right now. Everyone needs to keep working hard to keep it going, but its really been accepted and become a winter institution," Kellam said. Establishing the center's role in the community has been one of Kellam's greatest tasks. "The past two years have seen very challenging avalanche conditions and people are making good choices," she said. "This isn't exclusively due to us, but I think we are part of it. In general, the level of avalanche awareness has grown, which you can see in magazines and people sharing information in public." Kellam said she has seen plenty of changes in her field over the 14 years since she began working for the Forest Service. Those include the introduction of computers, allowing her office to reach a much greater audience with vastly more detailed information. And this information has found an eager audience as more people have began venturing into the backcountry throughout the valley. "It's kind of a secret that there's fantastic backcountry here and generally great conditions without crowds like you have in the Teton Valley," Kellam said. "There's really a nice feel here and not a lot of people competing for turf." When it comes to getting into the backcountry herself, Kellam said there's a bit of a misconception when it comes to her job. "I don't get to ski nearly as much as people think I do," Kellam said. "I've had a lot of friends come out with me and they end up spending a good part of the day poking around the snow and digging holes. After that, they decide it's better to come with me when I'm not working." However, the fact that Kellam will be getting a whole lot more days off is being lamented by her colleagues. "Those will be some big shoes to fill," Ketchum District Ranger Kurt Nelson said. "Her dedication goes beyond the job. It's her passion and I think everyone knows that. This community will definitely miss her in that capacity." 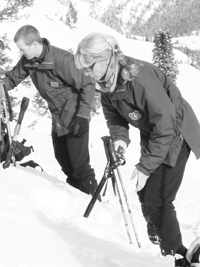 The Sawtooth National Forest Avalanche Center will host an "End of Many Seasons" party for retiring Director Janet Kellam at Galena Lodge on Monday, April 5, from 5-7 p.m. Beer will be provided at the potluck-style dinner, with wine and liquor also available. The dinner is open to the public and attendees with a last name starting with A through H should bring an appetizer, I through P a light main dish, and Q through Z a dessert. For more information, call Chris Lundy at 720-8791.